Here at Freedom we don't just make recumbent style vehicles! We also make a great utility bike. The bike has a low stepover frame, compact 20" wheels, a front drum brake and a wide gear range. It also has front carrying platform which can be fitted with a rack or bin (total nett payload 50 kg). A rear pannier rack can also be fitted. 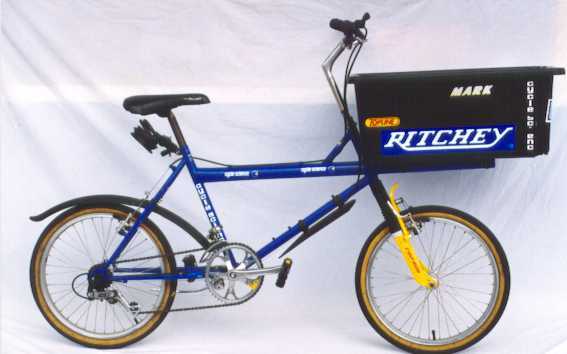 Utility bikes can be used at home for the shopping, for local deliveries or at work to carry loads. FRAME: Pulse TIG welded Chrome/moly. SEAT: Padded Velo gel. COLOUR: Royal blue powdercoat frame. HANDLE BARS: Steel with 90mm rise. FRONT HUB: Sachs VT 5000 drum brake. REAR HUB: Shimano STX-RC. RIMS: Velocity triple V. SPOKES: DT stainless steel 14g. TYRES: Duro skinwall semi-slicks. GEAR SHIFTERS: Shimano STX-RC rapidfire. CHAIN: Sachs SC-40. Alternative custom specifications or colours available on request. Accessories such as mudguards (fenders), racks or bins are available. *The "Utility bike" can be purchased as a frame kit by homebuilders. The kit contains: frame, fork, handlebar and steering assembly, (standard bicycle parts are required for completion).